New York City students play Ne$t Egg at the city’s Department of Youth and Community Development. In today’s uncertain economic times, understanding money matters is more important than ever. But America’s education system is not doing a good job of teaching financial literacy. Past surveys show high school seniors answer only around half of basic questions about stocks, bonds and credit cards correctly. 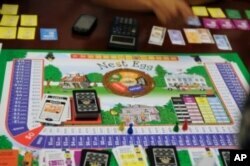 The inventors of a board game called Ne$t Egg hope their approach can get high school students off on the right financial foot. Most of the 13 New York City high school kids who recently gathered around a table to play Ne$t Egg had never thought about personal finance before. They were in an office at the City’s Department of Youth and Community Development, dice at the ready. Erin Kanter, head of marketing for Ne$t Egg, acts as the banker during the game. The kids form small teams and each team acts as a financial advisor for a fictional young couple that wants to buy a home, set up a college fund for their child, and retire 30 years from now, debt free. Ne$t Egg was created to help young people learn about finances in the real world. It’s up to the players to help them build their savings for the future - their ‘nest egg’ - and achieve those goals. A roll of the dice can bring a windfall or a disaster. “You know stocks go up and down, bonds, money markets, they are all part of the game,” says one of the game’s inventors, Vladimir Fichtner, who is from the Czech Republic. He and some friends came up with the idea for Ne$t Egg in the 1990s. After decades under Communism, when the state took care of everything and there were no stock or bond markets, Czech citizens were suddenly grappling with how to handle their own finances. Today, Ne$t Egg is played in hundreds of schools in the Czech Republic and by trainee bankers at the country’s largest bank. In New York, the Department of Youth and Community Development is experimenting with the game. If today’s pilot goes well, Ne$t Egg could be played in after-school community centers and possibly in high schools later on. Osorio and his colleagues say poor money management is at least part of the reason for this sobering statistic: 40 percent of New York City public school graduates who go on to one of the city’s colleges drop out within two years. Ne$t Egg has already been introduced into the high school curriculum 3,000 kilometers away in Corpus Christi, Texas. Carol Loeb teaches economics at King High School and says it used to be hard to get her students to grasp concepts they had no experience with. But that all changed with Ne$t Egg. She recalls one student who was failing when his class started playing the game. The games teaches some hard life lessons. Back in New York, Brendis Gonzalez and her teammates wanted to make $300,000 for their fictional couple’s retirement. They ended up with far less because they drew an accident card, and hadn’t bought disability insurance. Their family went bankrupt and had to start from scratch. Afterwards, Gonzalez says she learned from some of the big mistakes she made during the game. She’d like to use her newfound financial knowledge to help her widowed mother, a home health aide. “I’ve seen how much money has been a problem and I never even thought that like bonds could help you or that you could invest to make like your own money grow,” Gonzalez says. She’s never spoken to her mother about money, she says, but she’s about to start.